"I am Aragorn son of Arathorn, and am called Elessar, the Elfstone, Dúnadain, the heir of Isildur Elendil's son of Gondor. Here is the Sword that was Broken and is forged again! Will you aid me or thwart me? Choose swiftly!" to Strider. This is the TFL-listed & TML-listed Fanlisting for Aragorn from The Lord of the Rings and Other Middle Earth Books. If you're an Aragorn fan, as well, get listed as one! We opened on October 9, 2008. The last update was on April 08, 2019. There are currently 4962 fans listed, and 0 is/are waiting to be added. Welcome, Nina. This site is maintained by Tiffany & is hosted through Surpass Hosting. The images used in the making of this site came from Google and belong to their respective owners. No infringement is intended, this is purely a fan effort & nothing more. 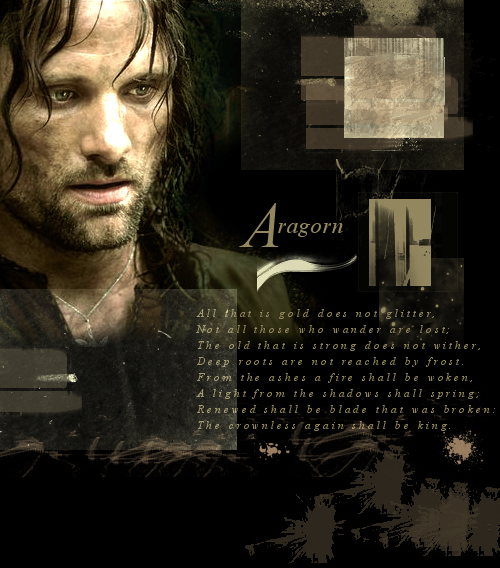 I'd like to say thank you to Francesca, who used to own the Aragorn fanlisting and sent me her members list.